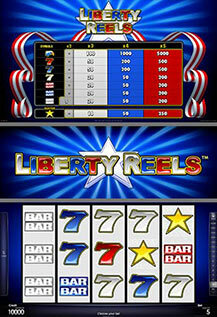 „Liberty Reels“ is a classic reel game in authentic US-style. It offers exciting and simple game fun. Take a flight with the eagle and feel true liberty. „Liberty Reels“ offers 5 lines and 5 reels. All prizes are for combinations from left to right and are on selected lines, except Scatter (STAR symbol). Scatter symbols pay at any position. Scatter wins are added to line wins.